Dialogue is conversation. To create good dialogue that brings a character alive and engages the reader’s attention, we must slip into each character that is speaking. As with most things that are written into pages of a story, dialogue should serve a purpose. One of those purposes is to reveal character. At first, new writers don’t realize how effective dialogue can be as a character-revealing tool. Dialogue can be used to show a description of a person (“Did you add highlights to your hair?”), it can dramatize tension (“I despise you!”), it can show a character’s thoughts or feelings (“I can’t wait until we get grandma’s house to see the new kitten.”), and it can show a character’s motivation. Words from a character’s mouth can tell a reader a whole lot. The questions to ask are, what purpose does this dialogue serve and does it characterize either character? Here is my response. Here is how the revision may look. Think about the successes of this new work compared to the first draft. This revision is much improved as far as revealing the characters. In this short exchange, the reader can reach several conclusions. One, each character speaks in his or her own way shown by the specific words chosen for each character, which lends to characterization. 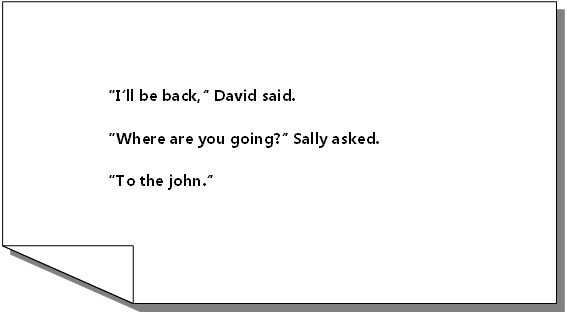 David is given to using slang when he speaks, while Sally is a little more formal. The stranger, on the other hand, is amused and makes a joke at David’s expense. Just remember that the way a character speaks should stay consistent, so that readers can expect that the assumptions they’ve made about the kind of person each of the characters are stay the same throughout the story. Two, the relationship between Sally and David does not seem overly friendly or they may be friends (or more) who are at odds with each other. It’s obvious that these two characters know each—they’re sitting together at a restaurant—but Sally’s response to David’s declaration can be taken several ways. Either she is correcting David’s speech by repeating his sentence more formally or she is questioning his declaration as if she did not understand his spoken words. With either motivation behind her response, Sally is mocking David’s speech. It could be that Sally doesn’t really understand David, and in that case, that tells the reader a lot about Sally—if slang confuses her, then she must have had led quite a sheltered life up to this point. Third is the beat before David’s spoken text. The beat is also known as action tags. When characters speak, their communication is enhanced with actions. Facial expressions, tone of voice, gestures, and other body language help signal the character’s intention. They also help writers subtly weave the character’s thoughts and feelings into the scene. In this scene, David’s beat of curling his lip shows his own disdain towards Sally. This builds on the reader’s presumption that while Sally and David may know each, they have a relationship that is on edge. 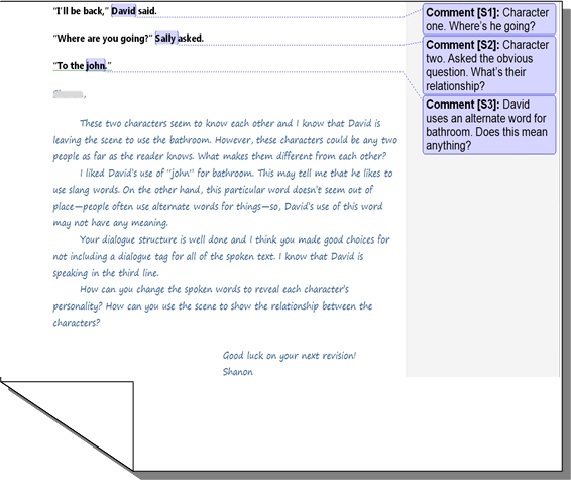 Sally’s correction of David’s use of slang and David’s facial expression does not indicate mutual respect is shared between the two characters—at least, not at this moment. Without the context of the whole story, we don’t know if Sally and David may have just had a fight or if their relationship is deteriorating. Last, we have the stranger’s remark. It’s likely that this line of dialogue is not meant to characterize the stranger, but it may serve many different purposes. One, it indicates that the setting is not populated with slang-wielding characters like David, so, David may be out of his element in the restaurant. Two, the fact the stranger feels at ease enough to make a joke may indicate that if David and Sally just had an argument, it likely happened before the scene occurred because if the two had just had words, most people would not intrude with a flippant remark. Three, this line of dialogue could serve the purpose of furthering the scene’s motivation. At this point, David’s response to the stranger would indicate a release of tension or it could heighten the tension. Either way, the stranger’s words are likely to provoke a response which adds to the restaurant scene in some way. Is there anything else you think this dialogue reveals about the characters? EXERCISE: Go to a public place and jot down the conversation around you. What can you observe about how people use dialogue? What can you learn about people just from what is said? This entry was posted in Action Tags, Beats, Character, Dialogue, Dialogue Tags and tagged action tags, beats, character, dialogue, dialogue tags on June 16, 2014 by S.D. Huston.